Gayatri Devi the personification of the Gayatri Mantra, used by Hindus worldwide, is considered to be the physical manifestation of the eternal endless God, Parabrahman. Gayatri Devi is seen by many Hindus to be not just a Goddess, but a portrayal ofGod himself, in the feminine form. She is also the mother of the Vedas and the Holy Trinity, Bramha Bhagvan, Vishnu Bhagvan and Shiva Bhagvan. Within her, she possesses the past, present and future, as well as the three realms of existence. Gayatri Devi is typically portrayed as seated on a red lotus, signifying wealth. 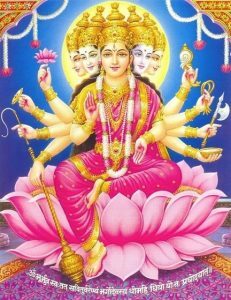 She commonly appears having five heads with the ten eyes looking in the eight directions plus the earth and sky, and ten arms holding all the weapons of Vishnu Bhagvan, symbolizing all of his incarnations.